Color ramps provide the means to apply a range of colors to a group of symbols. Color ramps are used, for example, in the Graduated colors layer symbology option. ArcMap has a range of color ramps already defined in the Color Ramp styles folder of the ESRI style. Some are created for specific applications, such as to display elevation or precipitation, but you can also create your own. Algorithmic—Linear stretch between two specified end colors designed to convey the amount or degree of a quantitative distribution like average income. Random—Alternating bands of random colors designed to display continuous qualitative values. Multipart—Combines other color ramp elements in a continuous band. An example is a color ramp designed to convey an entity with a zero point, like population growth or temperature. Preset—A ramp of individually specified colors. An example is a color ramp intended to convey elevation. Click Customize > Style Manager. Click the Color Ramps folder in the style tree in which you want to create a new ramp. Right-click the open space in the Symbol contents window, point to New, then click Algorithmic Color Ramp. 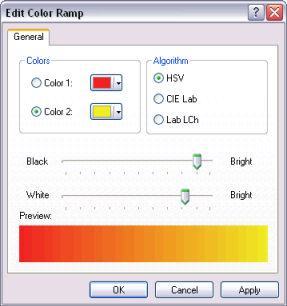 Click Color 1 in the Algorithmic Color Ramp Properties dialog box and set the start color for the ramp. Click Color 2 and set the end color for the ramp. Adjust the value of black and white brightness throughout the ramp. Type a new name for the color ramp. Sometimes it's easier to adjust a color ramp that already exists than it is to create a new one. For example, when you're working with data such as elevation, choose the Elevation color ramp in the styles folder. Copy and paste this to your personal styles folder. Double-click it to edit it and remove the parts not in your data, such as water or mountains (at the top and bottom of the list). You can create new color ramps for symbology as you work on the Symbology tab of the Layer Properties dialog box. Right-click the layer in the table of contents that shows a quantitative value and click Properties. Click Quantities and click Graduated colors. Choose a Value field and a Normalization field if desired. Set the number of Classes or change the classification scheme by clicking Classify. Double-click the top symbol in the list and set the start color for the ramp. Double-click the bottom symbol and set the end color. Optionally, double-click any middle symbol to set its color. This lets you create a multipart color ramp. Right-click a symbol and click Ramp Colors. You can change the display of color ramps from graphic to textual by right-clicking a color ramp and checking or unchecking Graphic View. You can save a color ramp created on the Layer Properties dialog box by right-clicking the ramp and clicking Save to style. Your new color ramp is saved in your personal style. The three ArcMap color ramp algorithms represent different methods for traversing the color spectrum. Each method provides slightly different effects, and which one you use depends on how well it suits your needs. HSV—The hue, saturation, value (HSV) method is a linear traverse of colors between pairs: Color 1 H to Color 2 H, Color 1 S to Color 2 S, and Color 1 V to Color 2 V. Essentially, all intervening colors are shown. The HSV algorithm was used for color ramps in ArcView 3.x and is perhaps the easiest color model to understand but may not be the most intuitive for map reading purposes. CIE Lab—This method blends two colors without traversing intervening hue space. The result is a smooth progression from Color 1 to Color 2. In many cases, this produces a very desirable smooth ramp between two colors. This algorithm takes the shortest path through the color spectrum. If you think of the color spectrum as a wheel of color progression beginning and ending with red, colors are chosen along the shortest distance on the circumference of the wheel to create the color ramp. One deficiency in this algorithm is that sometimes the colors near the middle of the ramp can appear muddy when Color 1 and Color 2 are extremely different, that is, when approaching the maximum distance possible on the color wheel. Lab LCh—This algorithm is very similar to the CIE Lab but does not seek the shortest path between colors. Instead, it works similarly to the HSV model but softens the effect of color transition considerably.